Injector nozzle coking is not the only concern faced by modern high pressure common rail (HPCR) engines. Internal diesel injector deposits (IDID) are causing substandard performing injectors that lead to decreased power, decreased fuel economy, and increased regulated emissions. 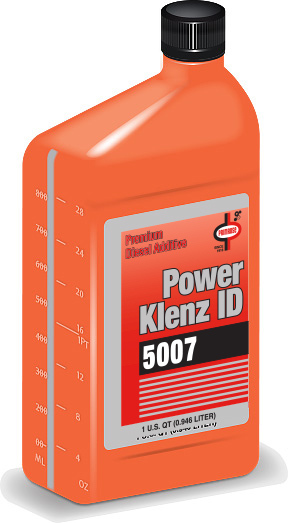 This coupled with other ailments, which can be present in ultra low sulfur diesel (ULSD), require the need for a Premium Select™ premium diesel additive (PDA).Power Klenz ID (PKID) 5007 is a Premium Select PDA engineered to eliminate injector problems associated with today's HPCR engines, enhance many other qualities of fuel and may be used in traditional diesel engines. PKID 5007 provides Premium Diesel qualities to ULSD in terms of detergency, stability, lubricity and cetane number. PKID 5007 contains a powerful cetane improver for maximum boost in power and performance and vastly superior IDID quick clean / keep clean additives.